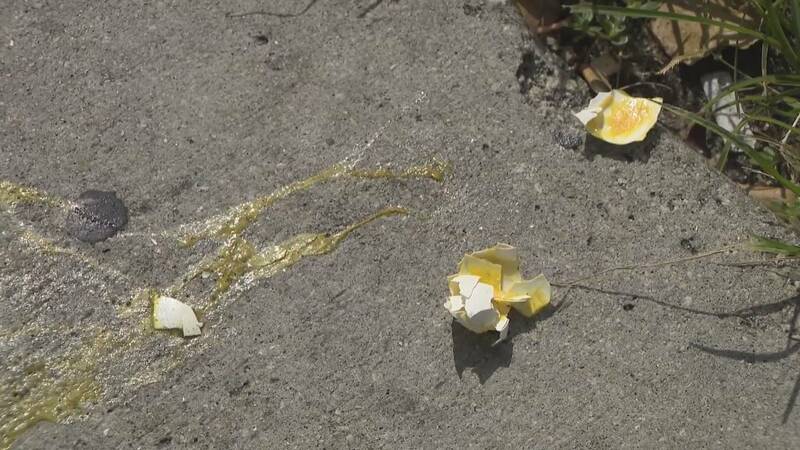 WILTON MANORS, Fla. - Brian Carter said he and two friends were standing outside of Gym Bar in Wilton Manors Monday Night when someone started throwing eggs at them. "I mostly just heard the yelling and was pelted right away," Carter said. "It was a pretty heavy hit right here, but it splattered so much and it hit a couple other people." Carter said the person yelled something about them being gay before throwing the egg and speeding away southbound on Wilton Drive in a black BMW. It appears Carter and his friends weren't the only ones who were targeted either. Just a short walk down Wilton Drive, Local 10's Ian Margol found more eggs, including one right across the street from the police department. For years, Wilton Manors has been a safe haven for the LGBT community and Gym Bar's owner Rick Schmutzler said he is disappointed to see people being targeted here. "And then some idiot decides he's going to drive by, throw an egg and yell a slur. It's cowardly. It's stupid. It's childish and it's ridiculous," Schmutzler said. Carter said police showed up quickly and took a report, but he decided to post about it on Facebook as well, sharing a picture of himself covered in yolk. Broken eggs were found in the area around Gym Bar in Wilton Manors. "They were definitely shaming us for being something that we feel like we were born with. I feel no shame for who I am," Carter said. He said the post was to show he isn't scared. In fact, he feels sorry for the person responsible. "It didn't hurt. I didn't go home and cry. I went home and went to bed," Carter said. "I kind of laughed it off, but I feel bad for the person that threw it. Why would he feel like he needed to do that?" Police are looking into this case. Anyone with information about the incident is asked to contact Broward Crime Stoppers at 954-493-TIPS. Meanwhile, in response to the incident, Gym Bar posted on their Facebook Tuesday that they aren't scared of eggs and have started a promotion for $3 breakfast sandwiches all day.